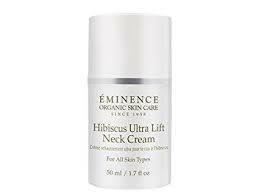 The Eminence Hibiscus Ultra Lift Neck Cream is loaded with Organic ingredients to rejuvenate and tighten the skin on your neck leaving it softer, plumper and more youthful looking. The blend of hyaluronic acid and hibiscus work great together to give you the results you are looking for. It so exciting to have an organic product that is safe for us and gives better results than the neck creams with chemicals. Softens and plumps leaving skin younger-looking. Improves skin’s elasticity and moisture content. Contains all-natural whole organic fruits, vegetables and herbs. Ingredients:Organic Phytonutrient Blend™ [Red Currant Juice*, Aloe Juice*, Olive Leaf Extract*, Cornflower Extract*, Hibiscus Flower Extract*, Red Clover Flower Extract*, Elderflower Flower Extract*, Grape Seed Extract*, Carrot Extract*, Beetroot Extract*, Soybean Germ Extract*, Rosemary Leaf Extract* And Vegetable Glycerin*], Hydrolyzed Soy Protein, Acacia Senegal Gum, Xanthan Gum, Arachidyl Alcohol, Behenyl Alcohol, Arachidyl Glucoside, Sunflower Oil*, Cetearyl Alcohol, Vegetable Glycerin*, Glyceryl Stearate, Shea Butter*, Lauryl Lactate, Edelweiss Callus Culture Extract, Glycerin, Paprika Extract*, Rosemary Leaf Extract*, Five Flavor Berry Extract*, Ginger Root Extract, Candelilla Wax, 1,2 Hexanediol, Caprylyl Glycol, Tropolone, Avocado Oil*, Botanical Hyaluronic Acid, Gluconolactone, Sodium Benzoate, Vitamin B3, Babassu Oil*, 'A'ali'i Flower Extract, Butylene Glycol, Ethoxydiglycol, Asofoetida Extract, Māmaki Leaf Extract, Sodium Hydroxide, Coconut Oil, Monoi Flower Extract, Vitamin E, Soybean Oil, Vitamin E, Provitamin B5, Biocomplex2™ [Acai*, Lemon*, Barbados Cherry*, Indian Gooseberry*, Baobab*, Camu Camu*, Carrot*, Coconut Water*, Goji Berry*, Tapioca Starch (from Cassava Root)*, Alpha Lipoic Acid And Coenzyme Q10].